I do have some swatchers that have some photos of a better persuasion coming my way. Until then this is what we are all stuck with. So, thank you to those that have bared with me. There is something just incredibly sad and harsh about a country that is experiencing a revolution or civil war. To imagine a country, a generation, a peoples so distraught with their daily lives that they need to revolt is something hard to imagine as a westerner, especially an American. We have to right to say this is crap without true fear of prosecution. However this is simply just not the case with many of the countries in Africa which have experienced some form of civil or military war over the last 200 years. Many of these conflicts are actually rather racially instigated. One tribe versus another, a mentality institutionalized by Western Colonialism in the continent. Now, while it would definitely be easy to just blame these conflicts on "THE Man" it is actually a rather prevalent concept throughout the world, however, the situations in many of the African Nations are definitely a result of the Great Colonial Empires manipulating and controlling one group over another. This is definitely the case in South Africa and several other countries. I cannot actually sit here and claim that I know or even understand the motivations of these very real and palpable wars, what I can say with 100 percent certainty is that the actions of yesterday will most certainly have an effect/consequence for tomorrow. Especially the ones we forget about that are helplessly stuck in the middle. This months collection will focus and remember the children that are unfortunate victims of these civil wars. We often forget that in non military wars, it is the civilian population that takes the brunt of the conflicts. Also known as women, children and the elderly. What happens when you lose your parents, even just one? I'm not sure I can really even begin to delve into the psychological damage of being bombed out, watching your mother raped and decapitated in front of you or watching your brothers, ages 5-17, taken to be brainwashed and trained as a new child militia. Because of the level of poverty that plagues most African countries like Liberia or Sierra Leone, even if a family member survives, the hardship of caring for a child, especially girls and children with special needs or considered "cursed" because of cultural superstitions, are generally abandoned to orphanages. Take just a second to think about that word, Orphanage. Now think about what that represents to you, any visual imagery or first instinctual feelings about what an institution like that means to you. Any one think of some famous books in western literature about little Orphaned children and the hardships and utter horrific existences they endured? Can you even begin to imagine? Now transport that to one of the most third world, disjointed and utterly diseased ravaged continents in the world. Can you imagine even less now? One of the products I named after a Ballerina that inspired me from one of my favorite Documentaries, "First Position" (Click Here). I had the opportunity to meet the director and was truly blessed that she is just awesome as the movie she created. Part of her awesomeness was this eye for seeing talent and finding those with amazing and truly inspirational stories. One being a Miss Michaela DePrince. She is one of these children and has experienced much adversity to get to where she is today. She is an amazing dancer which is another challenge she has experienced as in classical ballet there is truly this underlying belief that black dancers cannot do classical ballet. This is being challenged all over the ballet world and Michaela is one of the ones front lining the re-education. I don't want to just make this blog or any of the blogs I write to be just a pity party, woe is the poor of the world. That isn't the only message. Many of the Survivors, because yes, they are strong and awe-inspiring Survivors, have proven to be some of the most amazing people, turning what has happened to them into a tool to fight back and continue to improve themselves and the world around them. I see this is as being the silver lining. Although there is always the reality that many do in turn create more hatred and chaos, how can you blame them? It is all they know. I truly feel that children and war are just not conducive. It is the saddest tragedy and there will be many countries that continue to leave orphaned children in the wake of the destructive war torn path they create. We've seen it in Iraq, Afghanistan, Libya and more recently Syria. I have no idea how to even convey all the emotions and feelings that are stirred in me when I think of this topic. I cannot even begin to imagine, although it has always been my inspiration to adopt children that come from much less advantaged countries. It breaks my heart to think of all the children in the world that have no one, no matter the circumstances of how they became orphaned, they should never have had to experience what they did/do. 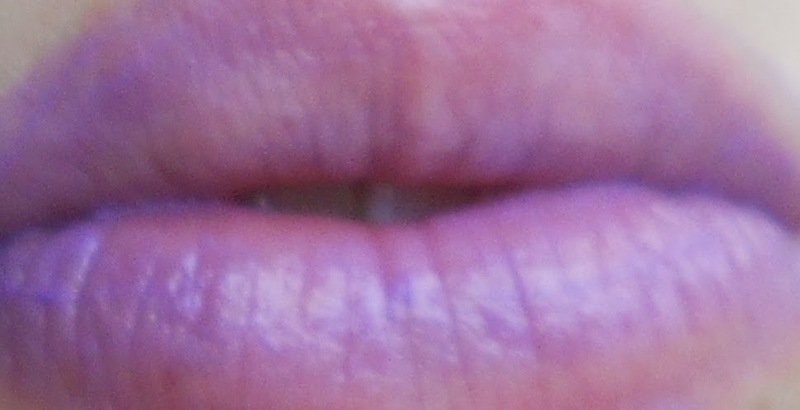 This Violet Lip Gloss leaves a nice glossy tint of color, not a stain and not totally sheer, this fun and gorgeous color is great way to welcome Spring in style. I was inspired by Michaela and her beauty and strength despite what she has suffered it has only made her a better person and helped her on the path she has begun as a professional classical ballet dancer! 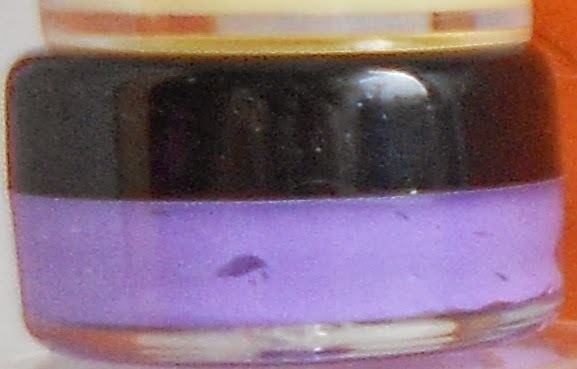 This bright but dark purple has strong contrasting pink and some purple and blue shimmer in it. This is a really beautiful color. Very cool toned and flattering for a fun Spring color. FreeTown was named after the Capital of Sierra Leone, where Michaela was born. It was the first town and country to be reclaimed and governed by Freed American Slaves. I was inspired by the excitement and vindication I can assume the settlers and Founders of FreeTown felt. It represented something so hopeful and yet has become so disparaged after decades of bloody civil and diamond wars. It had to be given it's own spotlight. I feel like this one's name and meaning is pretty self explanatory. Each one of these children that endures and survives these atrocities are chaos survivors, all the way. There are hearts and stars and even some butterflies. Hearts for those that still ache and stars for those who have turned this nightmare into something that makes them standout and shine and butterflies represent transformation, which is something each of these survivors had to do to overcome being just another faceless victim. This color, Sudan's Lost Boys, was inspired by and named after all the children that have had their youths stolen and their freedoms. Rebels with a gang mentality that abduct and kidnap young boys and make them kill their own countrymen. They are left with very little real world skills, education or family. Lost Boys a film about 2 refugees journey to America. 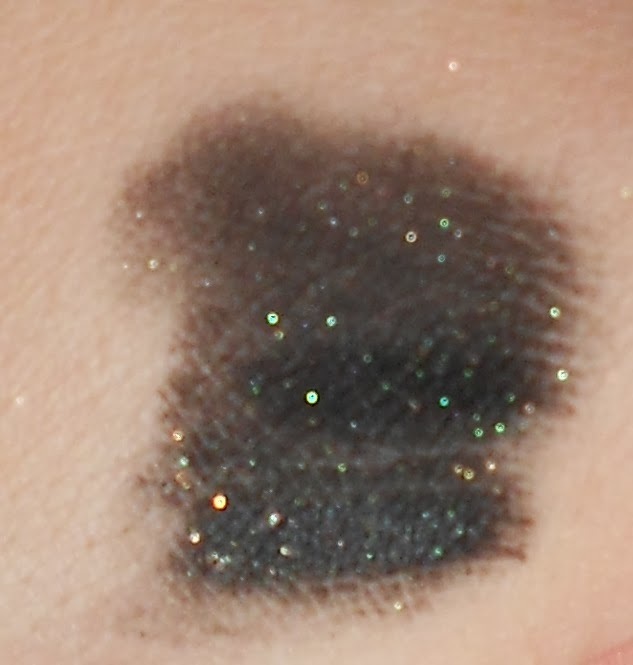 The Black shadow on the left is the eye pigment War Torn. This shadow is black with bronze and gold shimmers. 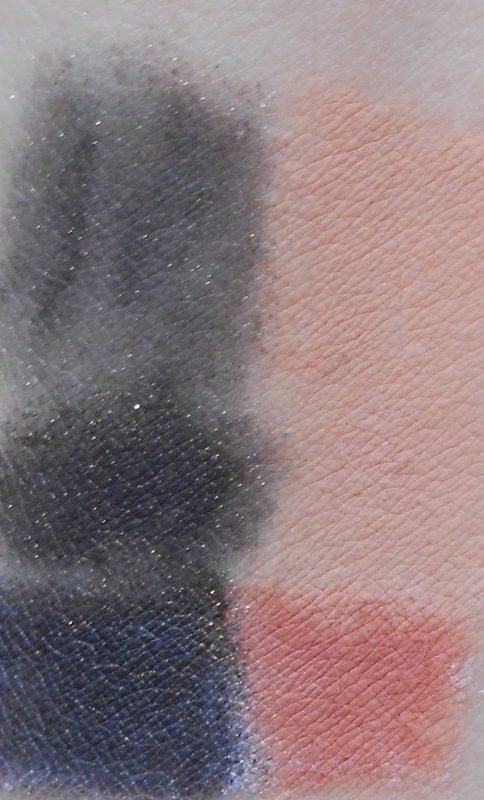 Top is raw/dry, middle is wet and bottom is over NYX Jumbo Liner in Milk. This shadow is for all the countries that have experienced, are experiencing or are still suffering from the aftermath of war. This extends so far out of the African Continent that it really is hard to fathom. From Haiti to Bosnia, Cambodia and Tibet, Armenia and Iran, and every where that has suffered the destruction of living in a country that is War Torn. I can watch as many documentaries or read as many stories as I can, but none of it can substitute for the experience these children go through and must endure for years after. Some are lucky, some are not. Some are adopted young and have the opportunity to reclaim their lives, some are left, alone, scared and unable to just be kids. Prostituting, rebel conscripted and at a very high risk for suicide. Is it not bad enough there are orphanages overflowing with children who lost their parents to an incurable disease but to also have the probability that they could also be killed in violent conflicts and massacres. Its because of stories like this that I do what I do. Please know there are always things that can be done to help and you can be that change. This collection has transformed a little from the beginning but I like where it has gone and am very happy with what has come together. 25% of your purchase price will be donated to All As One to help the children of Sierre Leon and help them try to reclaim some sense of normalcy and a life with pride in their country and themselves. The problem with adopting African Orphans is that only 13 countries have so far signed the Hauge Convention which underlies legalities and safety for children in countries with little to no litigation for these types of adoptions. Not to mention if said country cannot produce enough supply for the demand, it does not deter them from kidnapping and selling children that do not belong to them or shady parents selling their own children for a profit as there is very little regulations and documentation to verify the child's origin and safe handling. So many issues and moral quarries presented with problems like this and while I personally support adoption, I also understand the reasoning behind not adopting children from countries with no set laws or recourse for the issues presented with this. I think it is better to help them and empower them to be the change they want in their own countries and create the infrastructure so badly needed to ensure civil wars and rebellions don't just keep becoming a cyclical problem. Thank you so much for listening and I hope it helped remind you while we live this pretty comfortable life, there are those that don't and still continue to suffer the aftermath of these atrocities.